The 12th century castles chain prospered along the Southern Vosges. Your hike takes place in an exceptional panorama on the Rhine plain and in the Black Forest. Breathe the atmosphere of the Alsace region through its typical villages on the Wine Road, experience new feelings in one of its wine cellar, visit castles such as the Haut-Koenigsburg, and simply have a taste of Alsace local gastronomy and culture. Arrival in Barr, a very attractive village with beautiful and typical houses. The path goes from the famous wine village of Barr to Andlau through the beautiful castles of Landsberg and Haut-Andlau, a castle with two characteristic towers dominating the Kirneck valley with Barr to the North and the Andlau valley to the South. Today you pass by the Alsatian vineyard and the Wine Route. You walk around Ungersberg (901m) and visit the castle of Bernstein before beginning the way down towards the wine grower village of Dieffenthal. Paths go through woods and vineyards and lead to the landmark Castle of the Haut-Koenigsbourg. Reaching 750 metres at its highest point, the top of the Haut-Koenigsbourg castle looks majestically over the Wine Trail and the Alsace plain. This castle is one of the most popular monuments in France with 600 000 visitors a year. You arrive in Saint Hippolyte, a typical wine-producing village famous for its Rouge de Saint Hippolyte (Pinot Noir). 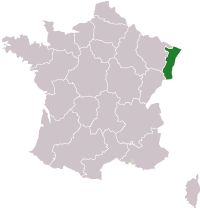 Saint-Hippolyte - Ribeauvillé ≈ 13 km (+339m/-328m). The beautiful villages of the wine trail follow one another and lead you to Ribeauvillé.. Situated amidst a pleasant, undulating landscape, Bergheim, a charming town right in the heart of the Alsace vineyards, is one of the rare Alsace towns to have almost completely preserved its medieval town walls (built in 1311). In Ribeauvillé discover its 3 castles (the Saint-Ulrich, the Ribeaupierre and the Girsberg). You will arrive in Riquewihr, a magnificent medieval town that for centuries has managed to combine the quality of its architecture with the quality of its world-famous wines, therefore getting its nickname: «The Gem of the Alsace Vineyards». 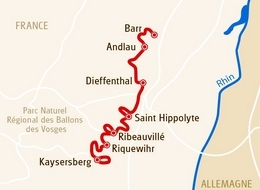 For your last stage, you will pass by the Chapel Saint Alexis before reaching the beautiful castle of Kaysersberg. Don't forget to appreciate the magnificent view. Take the stairway with its 100 steps up to the top for an even more splendid panorama over Kaysersberg! If you want you can continue to Kientzheim. You can visit the Alsatian Wine Museum to learn more about Alsace wines or walk around inside these almost completely intact city walls.